As the 2016 presidential race heats up, The New York Times reported Tuesday that Hillary Clinton and Elizabeth Warren had a private meeting in December at the Clintons' home in Washington, D.C. 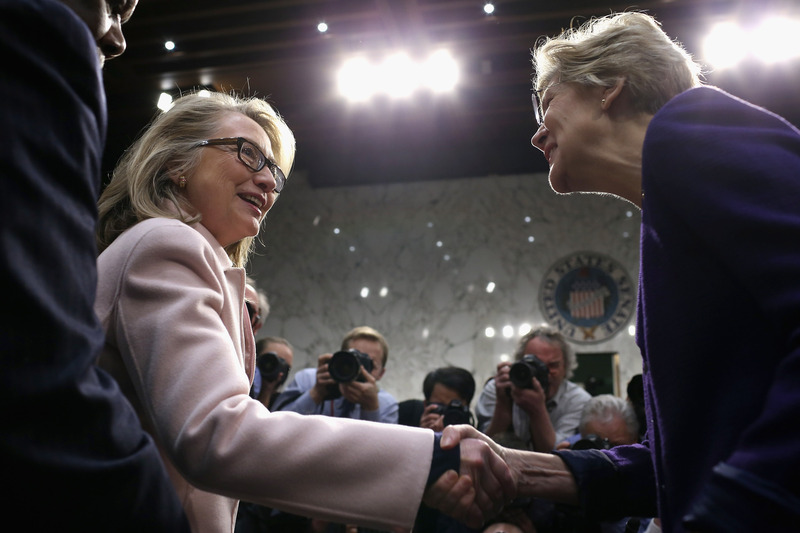 The meeting was held without aides present after Clinton extended an invitation to Warren, according to the Times. A meeting between Clinton, who has sorta kinda been gearing up for a potential run for the Democratic nomination, and Warren, who has stated repeatedly that she won't be running for president, despite her growing popularity and influence within the party, would seem to suggest that Clinton recognizes she might need the senator from Massachusetts if and when she decides to run. According to the Times, Warren's outspoken criticism of Wall Street would give Clinton some much-needed credibility in that area. It doesn't seem that Clinton asked Warren to support her campaign, but neither woman commented for the Times story, so all we have is their anonymous Democratic aide, who called the meeting "cordial and productive," and said that they talked about policy ideas. Even though they are arguably the top two women within the Democratic party, Warren and Clinton don't really know each other all that well. So what would two super powerful women who are trying to break the ice chat about? Both these women have fought for health care, so it's likely that topic came up during their dinner. Clinton recently co-authored an op-ed in The New York Times urging Congress to reauthorize the Children's Health Insurance Program. And Warren called out drug companies at a recent health conference in Washington, Politico reported, for putting profits ahead of patient care, and finding ways around the law. This is another issue that's near and dear to both Warren and Clinton. For Warren, it has become one of her core issues, famously telling an online forum that "wealth trickles up," as CNN reported. And Clinton has spoken about the long-term consequences of falling middle-class incomes, according to MSNBC. This one's more on the wish list. But look, running the world and keeping bankers in line is stressful work, so if any two women deserve to relax with a glass of chardonnay, Clinton and Warren definitely do. If there was wine on the menu, here's hoping Clinton shared a bottle of one of the Victory White vintages created for her and Bill by Clinton Vineyards (who, it should be noted, are no relation to the former president). Victory probably tastes pretty sweet.